Air Macau Company Limited (Chinese: 澳門航空股份有限公司 ) is the flag carrier airline of Macau. It operates services to 23 destinations in Mainland China, Japan, South Korea, Thailand, Taiwan and Vietnam, as well as regional international services, from its hub at Macau International Airport. In 2014, Air Macau carried 2.12 million passengers with an average load factor of 68.20% and carried 15,900 tonnes of cargo and mail. 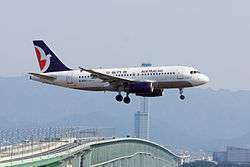 The airline was established on 13 September 1994, and began commercial operations on 9 November 1995, with a flight from Macau to Beijing and Shanghai. Prior to 1995, there was no air service to Macau since 1962 other than the helicopter service. Seaplane service had been provided by Macau Air Transport Company from 1948 to 1961. 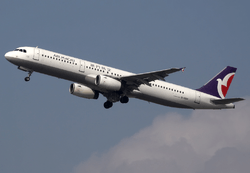 One-aircraft service between Beijing, Shanghai and Taipei began on 8 December 1995. The first pure-freighter service was launched on 7 October 2002, between Taipei and Shenzhen via Macau. Air Macau is owned by China National Aviation Corporation (CNAC) (51%), TAP Portugal (20%), STDM (14%), EVA Air (5%), the government of Macau (5%) and Macau investors (5%) and employs 1,245 staff (at March 2016). In 2009 two companies controlled by Edmund Ho, the Chief Executive of Macau sold a combined 1.25% stake to Air China for a sum undisclosed by the parties. In 2010 TAP sold its share to Air China. The head office is currently in the Edifício CNAC (Traditional: 中航大廈, Simplified: 中航大厦, Jyutping: zung1 hong4 daai6 haa6, Pinyin: Zhòngháng Dàshà). Previously it was in the Edifício Tai Wah (Traditional: 大華大廈, Simplified: 大华大厦, Jyutping: daai6 waa4 daai6 haa6, Pinyin: Dàhuá Dàshà). Airbus A319-100 B-MAO landing at Kansai International Airport, Japan. Two Boeing 727-100Fs were rented to provide air cargo service to Shenzhen and Taiwan from 2002 to 2006; both have returned to revenue service Transmile Air Services (and repainted from Air Macau livery). Both aircraft were replaced with two A300-600RFs owned by Air Macau. These two Airbus A300 left the company in 2012. Two old A321-100 were replaced by two new A321-200 in 2013. Although Air Macau serves as Macau's flag carrier, the Special Administrative Region of Macau flag has never appeared on any of its aircraft. Neither did the flag of Portugal appear on its aircraft prior to the 1999 handover. In November 2014, Air Macau welcomes the arrival of a brand-new Airbus 321 aircraft namely “PROSPEROUS”. The highlight of “PROSPEROUS” is painted with tourism image of Macau. There are two parts of design. In the front part of aircraft body, the designer is inspired by the Dragon whisker leaping from bottom to the top. The meaning is aircraft in the sky just like a flying dragon. 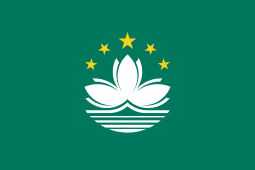 The red and green colors come the logo of Macau Government Tourist Office (MGTO). In the second part, line is from top to bottom. In this part, the famous scenes in Macau, such as Ruins of St. Paul's, Temple of A-Ma, Macau Tower etc. are presented in silhouette. 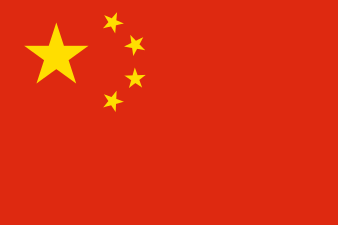 The dark green comes from the flag of Macau SAR. Light green provides an effective backdrop. Two parts come in one. The main idea of design is to let more people to understand Macau. The airline currently operates its own aircraft to 24 destinations including 15 destinations in mainland China. Air Macau and All Nippon Airways officially launch frequent flyer program cooperation from July 1, 2010. Air Macau Privileges members will earn mileages on all scheduled flights operated by All Nippon Airways and marketed by All Nippon Airways or Air Macau, and redeem Award Travel on all scheduled flights operated and marketed by All Nippon Airways. Macau Asia Express was a failed low-cost airline project, which was to be based in Macau and originally to be launched in 2007, offering scheduled flights mostly to China. It was founded on 24 January 2006 with an initial funding of $30 million. It was owned by Air Macau (51%) and ST-CNAC (CNAC and Shun Tak Holdings) (49%). The aircraft fleet would have consisted of 6 Airbus A320 short-medium haul jet aircraft, which was planned to be expanded to 15-20 aircraft over the first years in operation. In November 2007, the Macau Daily News reported that Macau Asia Express was suffering funding problems, which led to a delay at the taking-over of the already ordered aircraft, and finally the revocal of the Air Operator's Certificate in 2008. Air Macau is opening a new lounge at Macau International Airport from 16 Sep 2015, located at level 2 of Departure Hall. The brand-new Air Macau Lounge can seat approximately 122 people. Free WIFI access is also available throughout the lounge. ↑ "About Air Macau". airmacau.jp. Retrieved 25 March 2016. 1 2 3 4 "Directory: World Airlines". Flight International. 2007-04-10. p. 46. ↑ "Contact Us Service." Air Macau. Retrieved on 23 September 2009. "General Administration Office 398 Alameda Dr. Carlos D'Assumpcao,Edif.CNAC, 13-18 andar, Macau"
↑ "Contact Us." (Chinese) Air Macau. Retrieved on 15 December 2011. "澳門新口岸宋玉生廣場398號中航大廈 13-18樓"
↑ "Outras Empresas do Grupo TAP." TAP Portugal. 67. Retrieved on 15 December 2011. "693 Av. da Praia Grande Ed. Tai Wah 5/12 Macau"
↑ "澳航辦事處 - 澳航地區辦事處: 澳門." Air Macau. 2 April 2003. Retrieved on 15 December 2011. "澳門南灣街693號大華大廈5,8-12樓"
↑ "Air Macau Contacts: Macau." Air Macau. Retrieved on 15 December 2011. "General Administration Office 693 Av. da Praia Grande, Edif. Tai Wah, 5, 8-12 andar, Macau"
↑ "Fleet age Air Macau - Airfleets aviation". airfleets.net. Retrieved 26 June 2015. ↑ "Air Macau – Details and Fleet History – Planespotters.net Just Aviation". Planespotters. ↑ "Profile on Air Macau". CAPA. Centre for Aviation. Archived from the original on 2016-11-04. Retrieved 2016-11-04. ↑ "Air Macau "Privileges" and All Nippon Airways launch Frequent Flyer Program cooperation". airmacau.com.mo. 2010-06-30. Retrieved 2010-06-30. ↑ "Macau Asia Express to be launched later this year". m-Travel.com. 2006-01-27. Retrieved 2007-06-15. ↑ "Air Macau Opens New Lounge at Macau International Airport". airmacau.com.mo. 2015-09-16. Retrieved 2015-09-16. Wikimedia Commons has media related to Air Macau.